Be a Nature Mentor for ESN Project! 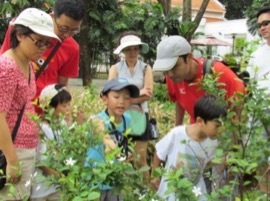 The Every Singaporean A Naturalist (ESN) is a new initiative by the Nature Society (Singapore) [NSS] that aims to provide school students and eventually the wider public a hands-on conservation experience to deepen their appreciation and knowledge of nature. With the successful engagement of 12 schools, we aim to increase the reach of the ESN programme to at least 30 schools by mid-2020. As our project continues to grow, we are looking for passionate volunteers to assist us. Join us as an NSS Nature Mentor to inspire and nurture the next generation to become future ambassadors of our natural environment and heritage. Training will be provided to equip Nature Mentors with the knowledge and skills required. · Mentor the students during their bi-weekly or weekly 20-minute monitoring sessions. Help them master their species identification over the weeks. · Follow up with the school’s monitoring and data uploading progress. · Support the teachers in their familiarisation with the usage of our resource package. · Conduct training on the monitoring methodology and species identification for the students and teachers when necessary. · Conduct guided Nature Walks in their school, nearby garden/park or nature reserve. o Available on at least one weekday. This is because the schools usually conduct their bi-weekly or weekly ESN activities during their CCA or school hours (on the same day of each week). The duration of each visit may vary from 0.5 to 2 hours. Attend additional training when necessary. For example, species identification of the other taxonomic groups monitored by the school. Strongly encouraged to attend a few relevant NSS Nature Walks to practice and master your species identification. Optional for experts. Visit the school on a bi-weekly or weekly basis for their ESN activities which include training, monitoring and etc. Keen to join us as an NSS Nature Mentor? Sign up here today! For further enquiries, please feel free to get in touch with us at esn@nss.org.sg. To find out more about the ESN Programme, click here.